In this week on Tuesday the moon will appear closest to Aldebaran, which is the bright star known as the eye of Taurus (the bull), an hour before dawn in the eastern sky. 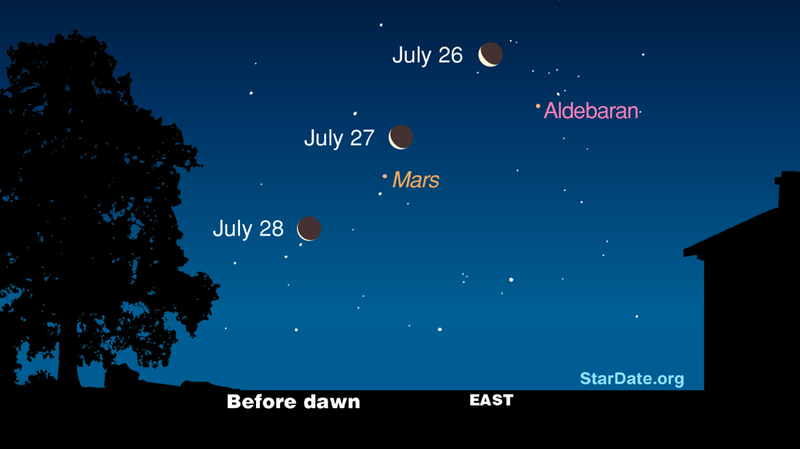 At the same time on Wednesday morning, the moon will shine next to Mars in the east. Mars and Aldebaran glow orange, but now the star is about twice as bright as Mars. As a star, Aldebaran produces its own glow. It shines orange because its surface is thousands of degrees cooler than that of our own yellow sun. Mars doesn’t generate any light on its own. It shines by reflecting sunlight, just like the moon.The light strikes a surface boasting various shades of orange, yellow, gray and black. Most of Mars’ oranges and yellows are produced by fine-grained dust that contains a lot of iron oxide, or rust.